Kinship At Christmas 2018: This Year It’s Double The Christmas Spirit. The Kinship At Christmas Foundation is back again this year at two Blue Mountains locations; Blackheath and now Blaxland. It’s our 19th continuous year of providing our Free Christmas Day Lunch! Our second venue will be the Blaxland Community Centre at 33 Hope Street Blaxland. This lunch is run in association with the great people at the Lower Mountains Neighbourhood Centre. Now, both the Upper Blue Mountains and Lower Blue Mountains will have venues for a free Christmas Day lunch and good company for those who may find themselves alone on Christmas Day. 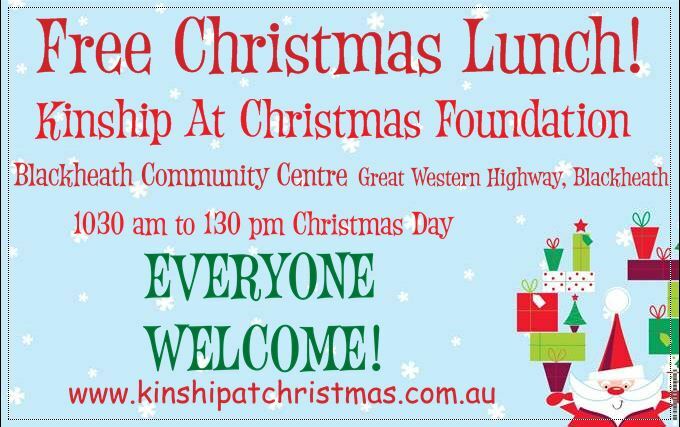 The Kinship At Christmas Foundation is a not-for-profit organisation that provides a free Christmas Lunch each year for people in the Blue Mountains and surrounding areas. We are not affiliated with any religious or other organisation, so you won’t be preached at or asked to join anything. You’ll simply be given courtesy, respect, a great meal and good company – all at no cost. Yes, no cost – no strings. We continue our one-day-a-year activity through the kind donations of local businesses, the Blue Mountains City Council, the efforts of great volunteers and the interaction of the community. We operate for the community by the community. Our primary goal is to provide a place for people to enjoy a great Christmas lunch. No one should spend Christmas day alone. For many people, Christmas Day can be the most lonely and isolating day of the year. It shouldn’t be like that. Our Christmas day lunch is free and open to everyone! Poor, rich, single, families, locals, visitors, you name it, our doors are open to anyone who wants to share the spirit of Christmas. Bring some family or friends or meet some new ones – it is up to you. The Blackheath Community Centre, corner of Great Western Highway & Gardiners Cres Blackheath. Doors open at 1030am (enjoy a nice Christmas morning tea) and lunch is served from 1130am to 2pm. Plus we will be operating another venue – at the Blaxland Community Centre, 33 Hope Street Blaxland. 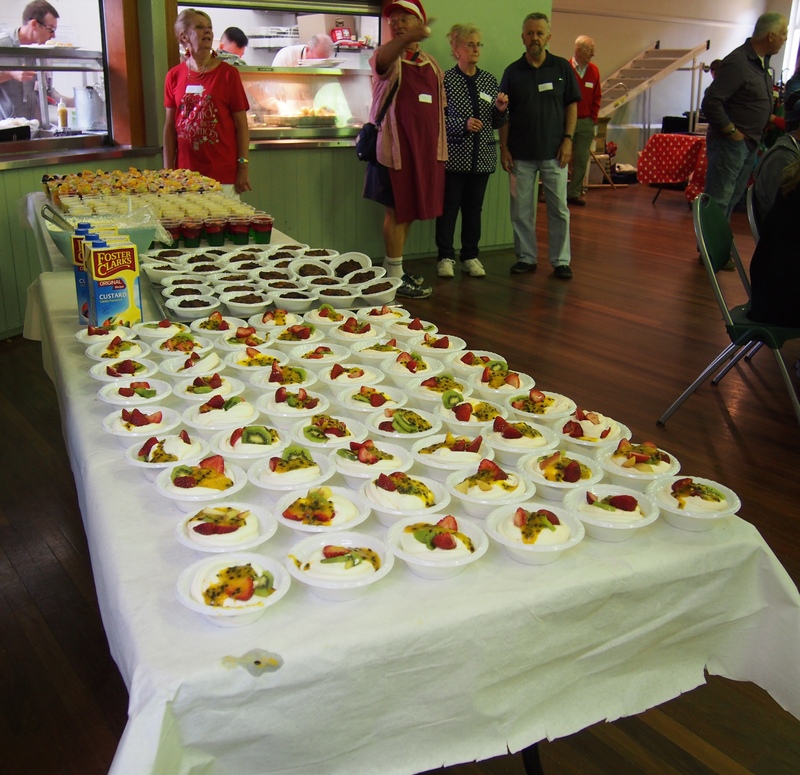 Doors open at 10:30 am with Christmas Morning Tea, with lunch to be served from 1130am to 2pm. Come along if you can. If transportation is a problem for you, please email us at mail@kinshipatchristmas.com.au and we’ll book you in to be picked up by our free shuttle. The bus will do a run from Glenbrook to Blackheath in the morning and back down the hill in the afternoon. 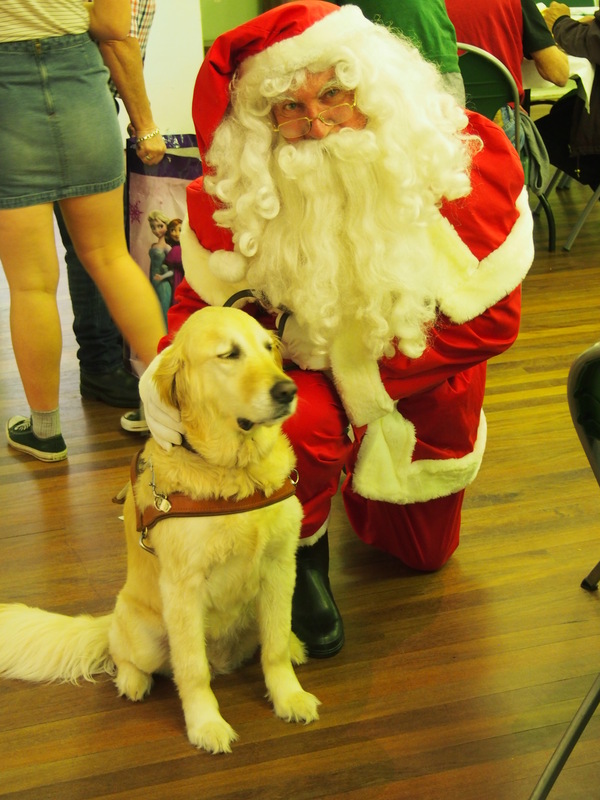 If you’d like to volunteer, send us an email at volunteer@kinshipatchristmas.com.au. We’d love to hear from you. On behalf of the whole organisation and all its great volunteers, I’d like to invite you to come along and share the community spirit. We Do More Than Just Christmas Lunch…. Now in its 4th year, the Kinship At Christmas Gift Giving Program is once again ready to spread happiness among residents of Aged Care Facilities in the Blue Mountains. The brainchild of Kinship at Christmas Director Roxanne Wilshire, the Gift Giving Program has been assisted with a grant from the Blue Mountains City Council Community Grants Program. The aim of the Gift Giving Program is to bring a a smile to the faces of residents of Blue Mountains Aged Care facilities. Many residents are frail aged people who find it difficult to make it to our Kinship Lunches, so we go to them with small gifts and a bit of Christmas cheer. It is a real honour to meet some of our oldest local citizens. If you would like to volunteer to come along on our planned gift giving visits, please contact us. Our fantastic 2017 Blackheath Volunteers! 2018 will be the 19th year of the Kinship At Christmas Foundation. That’s quite an achievement. 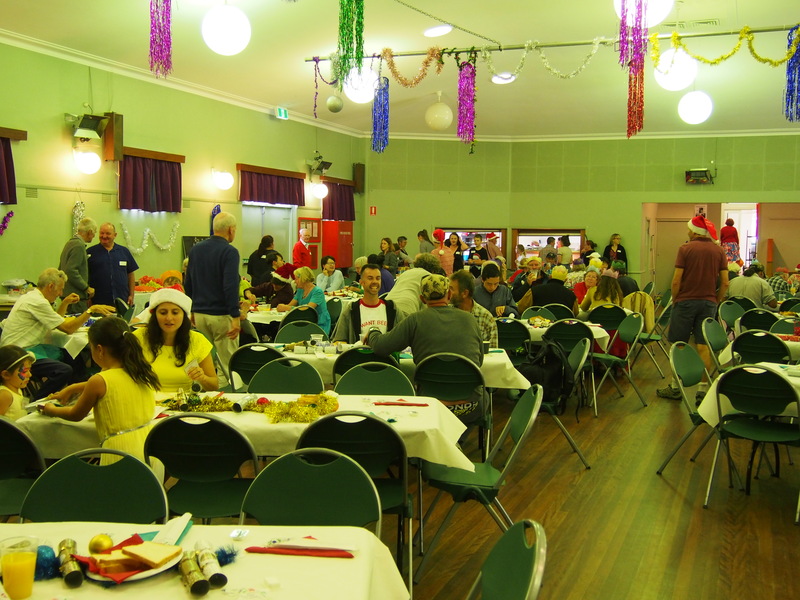 Formed by Brian & Liz Edmonds in 1999, Kinship At Christmas has served over 6,500 Christmas Day lunches over the years. With its first few years at Katoomba, and a few years at Windsor too, Kinship At Christmas 2018 will be held at the Blackheath Community Centre AND at the Blaxland Community Centre – our second Blue Mountains venue. Kinship At Christmas relies upon the generosity of many volunteers, and also local and statewide businesses and organisations and individuals. The great thing about Kinship At Christmas is that its doors are open for everyone – young, old, locals, visitors – everyone is welcome. It’s also free – no cost – and no strings, we are a very small, one-purpose charity that is not affiliated with any religious or other organisation. So, if you know anyone who would otherwise spend Christmas Day alone or you want to volunteer, or even if you want to get away from your relatives for a few hours, come on up to Blackheath and enjoy good company and good food and participate in the spirit of Christmas. We are not affiliated with any religious or other organisation. We continue our one-day-a-year activity through the kind donations of businesses, the efforts of great volunteers and the interaction of the community. We operate for the community by the community. Our primary goal is to provide a place for people to enjoy a great Christmas lunch. No one should spend Christmas day alone. If you know anyone who may want some company on Christmas Day, please let them know about us.